Amethyst - one of the Earth's beautiful stones. Color: Found in abundance, in its purest form, Amethyst is colorless. The finest quality Amethyst is medium to medium dark in tone, vivid in intensity, and purple, reddish purple to bluish purple in hue. Heating removes the color from amethyst or changes it to the yellow of citrine. Most commercial citrine is made in this manner. Description: SiO2 Amethyst is the most valuable transparent, coarse-grained variety of the silica mineral quartz that is valued as a semiprecious gem for its violet color. It contains more iron oxide Fe2O3 than any other variety of quartz, and experts believe that its color arises from its iron content. Other theories attribute the color to contained manganese or hydrocarbons. The name's origin: Amethyst derives its name from Middle English amatist, from Old French, from Latin amethystus, from Greek amethustos, not drunk or intoxicating. Wedding anniversary: Amethyst is anniversary gemstone for the 4th and 6th year of marriage. Varieties: Oriental amethyst, or purple sapphire, is not quartz but a variety of corundum, a much harder and rarer stone. 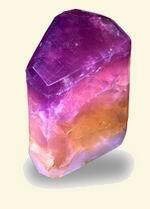 Care and treatment: Amethyst often becomes paler if kept out in the sun. 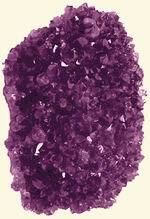 Clean your Amethyst in ultrasonic jewelry cleaner or with warm, soapy water and a soft bristle brush. Keep away from strong chemicals and avoid sudden temperature changes. Remember that in any type of repair involving heat, Amethyst must be removed from the setting. From the stone history: The story of the origin of amethyst comes from Greek legends: The god of wine, Bacchus, was insulted one day by a mere mortal. He swore the next mortal that crossed his path, would be attacked by his fierce tigers. Along came a beautiful maiden named Amethyst. Goddess Diana turned Amethyst in a beautiful statue of quartz to save her from the tigers claws. Remorseful Bacchus wept tears of wine over the stone maiden, creating a lively purple stone. Purple color has long been considered a royal color so it is not surprising that amethyst has been so popular through the history. Fine amethysts are featured in the British Crown Jewels and were also a favorite of Catherine the Great and Egyptian royalty. 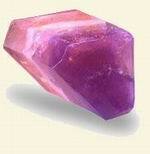 There are evidences that around 3,000 B. C. in Egypt and in anterior Asia were made jewels of Amethyst. The Amethyst is perhaps as popular today as it was in ancient time. Shopping guide: Amethyst is a wonderful affordable purple gemstone. Purple has long been the color of royalty and nobility. It is a deep, passionate color that evokes emotions. People who desire purple colors are individuals who like to make a personal statement, and express their unique taste. Designers celebrate Amethyst as the ideal choice for jewelry due to its regal color, variety in size and shape, affordability, and wide tonal range from light to dark purple. The pale colors are sometimes called "Rose de France" and can be seen set in Victorian jewelry. The deep colors are the most valuable, particularly a rich purple with rose flashes. Amethyst is wonderful in rings, necklaces, pendants, earrings, and bracelets. It is given as a symbol of sincerity, security, and peace of mind. Healing ability: Ametyst magnifies psychic abilities and right-brain activity. It strengthens immunity, while energizing and purifying the blood. Ametyst relieves headaches, improves blood sugar imbalance. Mystical power: The Greek work "amethystos" basically can be translated as "not drunken" , expresses the ancient folk belief that the stone protects its owner against drunkenness. As the myth goes, drinking wine from an Amethyst goblet would prevent one from becoming inebriated. The gemstone still symbolizes sobriety. Amethyst was thought to encourage celibacy. Because of that, amethyst was very important in the ornamentation of churches in the Middle Ages. Bishops still often wear amethyst rings. Amethyst is associated with a number of superstitions, being regarded as a love charm, and as a protection against thieves. Placed under the pillow at night, the beautiful amethyst is believed to produce a calm and peaceful sleep. Amethyst is given as a symbol of sincerity, security, and peace of mind. Deposits: Amethyst is mined in Brazil, Uruguay, Sri Lanka, Siberia, Canada, India, Bolivia, and Argentina and some African countries. 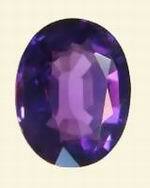 Zambia being a significant source for Amethyst. Generally, amethyst from South America tends to be available in larger sizes than African amethyst but amethyst from Africa has the reputation for having better, more saturated, color in small sizes. Very dark amethyst, mostly in small sizes, is also mined in Australia.